Dian Fossey is important because her life serves as a model for what one person – through persistent and courageous commitment – can do to make a difference in the world. As a result of her efforts, the world came to know the magnificent mountain gorillas of Africa. And a unique model for successful, active conservation was eventually created. Fossey left a legacy of innovations in gorilla research and conservation that continue to guide the work of those who follow in her footsteps. Before she began her innovative research, few studies of the rare mountain gorilla had been conducted – the most famous being an 18-month study by Dr. George B. Schaller. Fossey’s original objectives in founding the Karisoke Research Center were to study gorilla ecology, demography and social organization. However, the task was far from simple. She found herself spending days searching for and attempting to observe the shy animals, while constantly encountering signs that poachers and other human intruders had preceded her. She responded with determination and creativity. Fossey found that to study gorilla ecology and behavior, she needed to recognize individual gorillas, which first required the gorillas to become accustomed, or habituated, to her presence. To habituate the gorillas, Fossey followed suggestions from Schaller’s 1963 book on mountain gorillas. 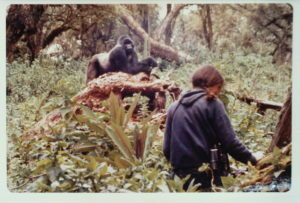 In addition, National Geographic photographer Bob Campbell encouraged Fossey to get closer to the gorillas so he could photograph her near them. But Fossey took these suggestions further by learning to imitate the noises made by gorillas as well as their way of walking on their knuckles. She even imitated their gestures and behaviors, including munching on wild celery and other vegetation to show her peaceful intentions. In this way, Fossey began to gain the gorillas’ trust. In 1970, an adult male gorilla she had named Peanuts reached out to touch her hand, while Campbell captured that famous moment with his camera. 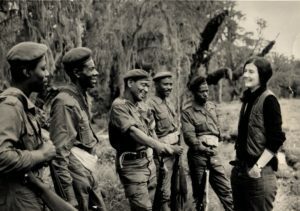 When Dian Fossey arrived at Volcanoes National Park, the park guards were underpaid and lacked the training and equipment needed for their dangerous job. The trade in “bushmeat,” live infant gorillas and souvenirs such as ashtrays made from severed gorilla hands flourished in nearby towns. In addition, people in villages surrounding the park would enter the forest illegally to graze cattle or set traps for game that could also harm gorillas. Fossey began to destroy traps, confront poachers and chase away cattle. She used her own funds to supply the park guards with boots, uniforms, food and additional salaries, and even hired some of her own anti-poachers. She referred to her tactics as “active conservation,” convinced that without immediate and decisive action other long-term conservation goals would be useless, since there would eventually be nothing left to save. Fossey’s war with poachers intensified following the tragic murder of her favorite gorilla, Digit, in 1977. After Digit died from multiple stab wounds while defending his family, who escaped safely, his attackers cut off his head and hands. 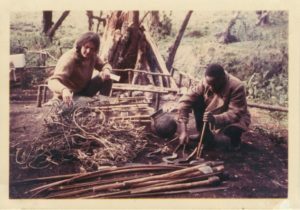 Fossey’s methods soon became controversial, as she attempted to frighten the poachers with simulations of witchcraft and threats of violence. Although we no longer use such methods, Karisoke continues to employ an armed anti-poaching patrol to this day to protect the gorilla groups we monitor, now with the full partnership of the Rwandan park and wildlife authority. Karisoke’s patrols find and remove approximately 1,000 snares each year and help bring poachers to justice, sometimes joined on patrol by park rangers. After Digit’s death, Fossey also began a campaign to gain the public’s support for gorilla conservation, founding the Digit Fund for that purpose. She had already attracted attention to the cause through her articles in National Geographic. Following her tragic murder in 1985, the Digit Fund was renamed the Dian Fossey Gorilla Fund International. The success of Fossey’s book Gorillas in the Mist also brought the plight of the mountain gorilla to the world’s attention. In 1988, a movie based on the book reached large audiences. Sigourney Weaver, who played Dian Fossey in the movie, became the honorary chair of the Dian Fossey Gorilla Fund International. With the success of both the book and the movie, more people now understand that gorillas are “gentle giants,” with much to teach us and the right to survive in their forest home. Click here to continue Dian Fossey’s legacy by supporting the Fossey Fund’s gorilla protection efforts in Rwanda and Congo.